In Japan, SKA-related activities have been led by the Japan SKA consortium (SKA-JP), which consists of more than 170 individuals from research institutes and universities. Members are working on SKA-related sciences such as the Epoch of Re-ionization (EoR), cosmology, galaxy evolution, cosmic magnetism, pulsar, astrometry, transient and ISM. Engineering works such as reduction software, wideband feed, digital backend are also being worked on. Here is some of the most recent major news and activities in Japan that are reported below. SKA is listed in the “Master Plan of Academic Large Facility Projects”. The Science Council of Japan (SCJ), which is the representative organisation of the Japanese scientist community, started discussing a master plan of academic large facility projects in 2010 in order to gain the community’s consensus on the future plan. They have also released the “Master Plan 2011” in the following year, with the SKA being selected as one of the projects of “Master Plan 2011”. On the 12th of March 2014, SCJ updated the “Master Plan of Academic Large Facility Projects” after careful assessments of the proposed projects. The SKA has been regarded as an important project for Japan again, and has been selected as one of the projects for the new “Master Plan of Academic Large Facility Projects”. The current version is written in Japanese and the electronic version can be downloaded from the SKA-JP webpage. The content is planned to be translated into english. The SKA-JP High-z Galaxy Working Group has been hosting a domestic meeting entitled “SKA-JP Science Meeting on High-z Galaxies and Galaxy Evolution” since 2013. The second meeting was held at Hongo campus, University of Tokyo, on the 24th & 25th of March, 2014. The meeting comprised of 11 talks on high-z galaxies and galaxy evolution, and 22 researchers joined the discussions on the future activities. The SKA-JP Cosmic Magnetism Working Group has been hosting a domestic meeting entitled “SKA-JP Science Meeting on Cosmic Magnetism” since 2012. The third meeting was held at the National Astronomy Observatory of Japan (NAOJ) in Tokyo, on the 13th & 14th of November, 2014. The program was composed of 3 introductory talks and 5 invited talks on the cosmology, the large scale structure, galaxies, interstellar medium, and solar magnetism, and also 17 contributed talks. About 40 researchers participated in the meeting and discussed key topics on which Japanese researchers should focus on. In the afternoon of the second day, tutorials on the reduction of polarisation data were provided with the data obtained with JVLA and ATCA. It was a great opportunity to increase the polarisation data users and to also encourage the beginners to start SKA-related observational works with the available data. 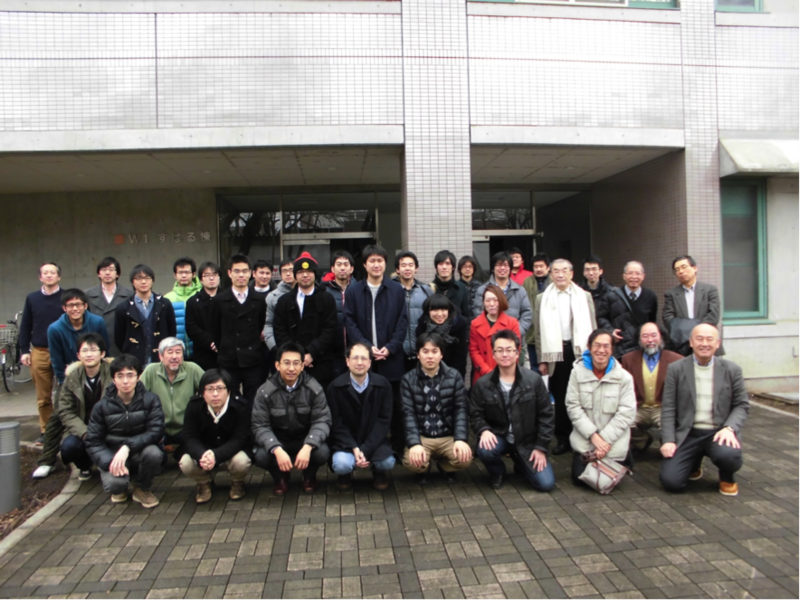 On the 3rd – 5th of March 2015, a domestic workshop entitled “SKA-JP Workshop 2015” was held at the campus of NAOJ, Tokyo. The primary purposes of the workshop was to introduce the new SKA-JP science book and to discuss Japanese science cases based on this science book. The workshop comprised of 4 introductory talks, 8 invited talks, and 13 contributed talks. Group photo taken at SKA-JP Workshop 2015. SKA-JP is hosting a SKA special session during the annual meeting of the Astronomical Society of Japan held at Konan University, Kobe, from the 9th to 11th of September, 2015. This will be organised as an international session and 4 speakers have been invited from the SKA Office and member countries. It will be a great opportunity for Japanese researchers to know more about the current status of the SKA project and to promote SKA-related activities in Japan.